Past Projects | Send the PITT National Society of Black Engineers to Nationals! Send the PITT National Society of Black Engineers to Nationals! Although their campaign has concluded, if you would still like to make a donation to support the National Society of Black Engineers, you may always do so here. Help the University of Pittsburgh’s National Society of Black Engineers attend the National Convention this year in Pittsburgh, PA! PITT NSBE is a student led organization that brings opportunities to engineering students of color, however to be a member you do not need to fall in this demographic or even be an engineering major! We seek to afford our members with a safe space to grow and develop. We help each other and cultivate our skills to be successful in today’s competitive work force! Not only do we serve our members, but we serve our community as well through the implementation of multiple outreach programs geared towards underrepresented youth in Pre-College Initiative and Technical Outreach. 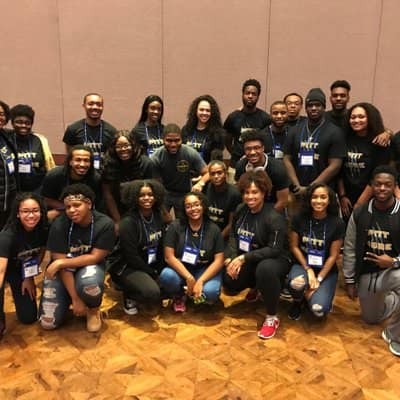 In addition to having a presence on campus and in the community; the University of Pittsburgh’s NSBE chapter attends all regional and national conferences. Our organization has over 65 members and we typically bring about twenty members to National and Regional competitions. This year the national convention is in Pittsburgh, and we want to represent the home-front strongly. We need your help to hit this goal! We hope that you will help us to uphold the national NSBE mission: to "increase the number of culturally responsible Black Engineers who excel academically, succeed professionally and positively impact the community." Your donation will primarily pay for the registration costs for our members. Because the conference is taking place in our home city, we do not have to pay some of the typical conference expenses (e.g. flights, hotels). Any funds raised over the amount needed to send our members to Nationals will go toward NSBE's general club expenses. Help us take advantage of this unique opportunity and send as many members as possible to the conference! Any contribution is important and significant, and we thank you so much for any way you are able to help us. We look forward to keeping you all updated with stories and pictures from our trip to Nationals! Your donation helps us get to Nationals! Pay a quarter of the fee to send a member to Nationals! Pay half the fee to send one member to Nationals! Send one member to Nationals, where he or she will be able to attend four days of exhibition booths, mentoring, workshops, and keynote presentations! Send two members to Nationals, where they will be able to attend four days of exhibition booths, mentoring, workshops, and keynote presentations! Send five members to Nationals, where they will be able to attend four days of exhibition booths, mentoring, workshops, and keynote presentations!